Store the Round Trash Bin - Black under your dorm room desk, bedside, or mini-kitchen. Important for keeping your dorm room organized and clutter-free. When we talk about dorm room organization, we don't just mean essential college storage items. Of course, dorm supplies that help you store your college essentials are definitely important, but there is one other small dorm item that will make a big difference to the overall appearance of your dorm room. When you're shopping for all of your college essentials don't forget about a necessary trash can! If you have trash lying about on your dorm room floor or your college furniture it won't matter how organized your dorm room is, it will look messy. At DormCo, we like to have you covered for all of your dorm room needs! 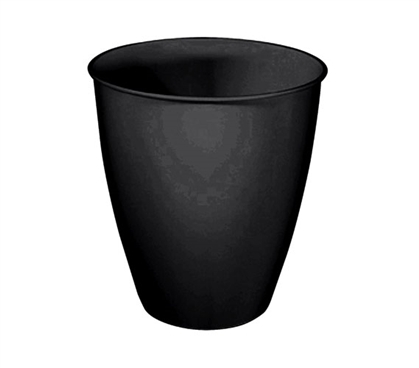 Our Round Trash Bin - Black is the perfect size for your dorm room! Store this handy black trash bin underneath your dorm desk or by the side of your Twin XL bedding. Leaving your dorm room clutter free will help give it an organized look that will also help you relax when you're in your dorm room. This stylish black trash can is also the perfect color to blend in with your dorm decor and college bedding, make it a college essential must have!